Western media is pretty pathetic. 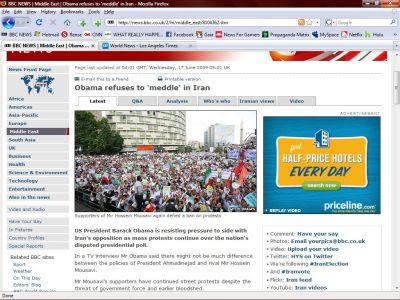 On June 15, 2009 Western media went to great lengths to convince its gullible readers that Iranians were revolting against the victory of Ahmadinejad by using a photo of his SUPPORTERS and claiming these were the Mousavi protesters. Here is one example of how the BBC uses phoney pictures to create a mindset with it's readers. Here is the 'correction'. Guess someone complained. Update 19 June 2009: an earlier version of our caption was incorrect. 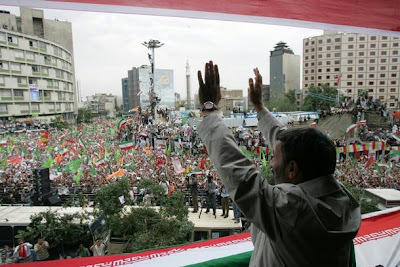 We wrongly stated that this was a pro-Mousavi rally when in fact it was a pro-Ahmadinejad rally. 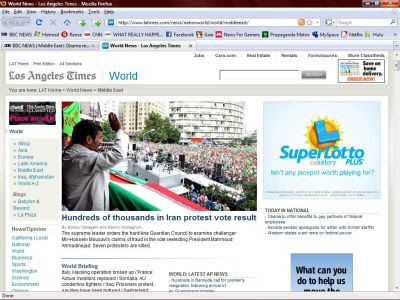 Here is the same picture used by the LA Times to give the impression that Iranians are protesting AGAINST Ahmadinejad. Here is the true caption and picture from a slightly different angle. You can notice in the first and last pictures that the images are from Getty. Anyone who thinks they have the real picture of what is going on in Iran from Western media, please leave your contacts details below. I have a bridge I want to sell you. , Egypt, Palestine and Georgia not covered? "I can't recall seeing one video of one of the hundreds of children killed in Gaza shown in the US media. In contrast, two days ago CNN broadcasted footage of a woman who was shot and bleeding to death on a Tehran street."